by offering Safety Around Water, a partnership designed to bring swim lessons to more locations throughout Milwaukee County. A wide range of swimming options for the whole family are available with swim classes that begin at 6 months of age and go all the way up to adults. YMCA Swim School provides children in the community the access to swimming lessons to teach them the lifelong skill. Try something new! From private swim lessons to safety courses for Boys Scout badges, the Y offers a variety of fun and unique aquatic programs to give you another way to exercise or gain new skills. 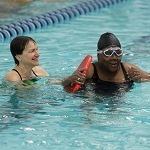 The Y offers water exercise programs, including shallow and deep water classes, low impact classes, high intensity cardio classes, and active older adult classes. Please check with your local Center for class availability. The Y offers lifeguard certification and training programs year-round. Click on the link below to visit our Safety Trainings webpage and view descriptions of the classes offered. We enrolled Max in Parent/Child Swim Lessons when he was 6 months old and it’s been a great experience. The instructors play games and sing songs, which is encouraging and relaxing for the kids. 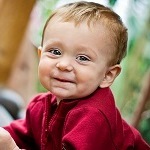 After a few lessons he was kicking, rescuing toys from the pool and blowing bubbles in the water. It really helped him get used to the water and see the pool as fun.